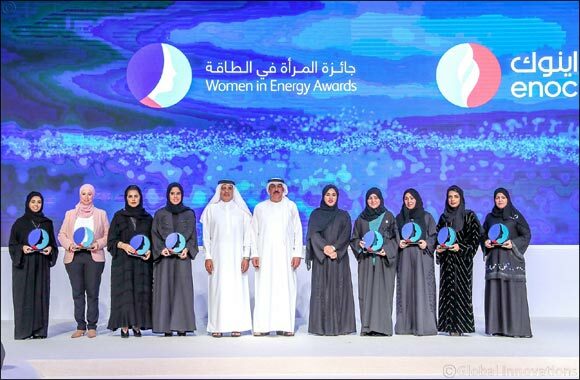 Dubai, UAE; January 22, 2019: ENOC Group’s inaugural ‘Women in Energy Awards’ honoured eight women in a first-of-its-kind award ceremony held to recognise women’s achievements within Dubai’s energy sector. The biennial awards which were previously announced on ‘Emirati Women’s Day’ in August of 2017 saw several strong entries from nine government entities across three major categories. A third-party judging panel followed stringent qualifying measures in selecting winners in the business, professional and social categories. Eng. Nada Jasim from RTA and Eng. Maryam Obaid Al Mheiri from Dubai Municipality were declared winners in the highly coveted ‘Best Woman Leader in Energy Sector’ within the business category, while Salha Ali Aldisi from DEWA was recognised as the ‘Best Professional Personality in Energy Sector’ under the professional category. Fatma Essa Almuhairi from DEWA took home the ‘Best CSR Contribution in Energy Sector’ award in the social category. The other winners were Dr. Dina Mohamed Ibrahim from DEWA and Eng. Niveen Al Kendy from ENOC Group in the ‘Best Woman Technocrat in Energy Sector’ awards while Eng. Noora Ahmad Ali Abdulrahman from DEWA and Shamma Al Falasi from ENOC Group won the ‘Best Young Woman Leader in Energy Sector’ award. According to a recent Ernst & Young Women in Power and Utility Index, women represent only 20 per cent of the global energy sector workforce, while the representation of women in senior executive positions worldwide is in single digits. Applicants represented organisations in the energy and power sectors, such as Dubai Electricity and Water Authority (DEWA), Dubai Municipality, Dubai Supply Authority (DUSUP), Dubai Petroleum, ENOC Group, Emirates Global Aluminum (EGA), Roads and Transportation Authority (RTA), Regulatory and Supervisory Bureau for Electricity and Water and Dubai Supreme Council of Energy. The judging panel is a third-party company known for its experience in similar projects and awards in the UAE. The company is a member of International Awards Board, American Society for Quality and has previously managed the Emirates Business Award managed by the Dubai Quality Group. The next cycle of ‘Women in Energy Awards’ will commence in 2020.